Simon Washbourne does a fine line in characterful little self-published RPGs. Barbarians of Lemuria is the one which has attained the most widespread attention, but I also find a lot of charm in Woodland Warriors and he’s also managed to show imagination in some unusual adaptations of OD&D. It’s charming work like that which I think of when I say that the RPG industry might need the RPG hobby, but the hobby doesn’t need the industry; were the industry to collapse altogether, I reckon the hobby would do just fine with talented hobbyist publishers like Washbourne putting out material. 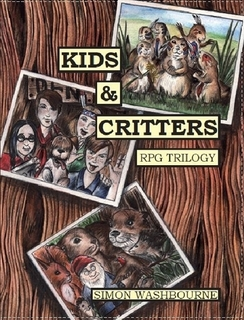 For this review, I’m going to look at the games contained in Kids & Critters, a compilation of three RPGs by Washbourne which embrace various family-friendly genres that are poorly served by the RPG industry in general. This is a Watership Down-y, Duncton Wood-y, Animals of Farthing Wood-ish sort of deal, in which the player characters are the animal inhabitants of the titular Wood (a generic British forest, based on the wildlife described). Twelve options for player character animals are provided, with Gnomes also available as an additional option (very much in the David the Gnome mode); other species are reserved for adversaries or allies under the control of the referee. Notably, most of your character’s capabilities will be defined by their species at game start, with only very limited capability for customisation: by and large new skills, lores, and improvements to ability scores must be earned with experience. This helps emphasise the distinction between species. Another interesting feature is the concept of the Way – an ethical standard which involves refraining from deliberate harm which some animals follow whilst others (generally the more vicious predators) spurn. By default, the animals here are very animal-y, though I suppose it would not take much effort to shift gear into a more anthropomorphised approach akin to The Wind In the Willows (indeed, the capacity of owls to summon Pan puts a weirder section of that novel in mind). Either way, this is a reasonable enough system for simple, heartwarming stories of this sort of mode. I could do without the glib use of “gypsy” in the sample adventures, mind. This game has the player characters as children of around 10 to 15 years old, sleuthing it up and having adventures in Idyllic England. Idyllic England is basically that Enid Blyton/Daily Mail version of England that the Famous Five and various other groups on the same theme knocked about in – nobody swears, the weather is always lovely in summer and snowy at Christmas, authority figures are basically correct and villains or criminals usually have a suspicious air about them. Adventures often culminate in the kids unmasking some sort of criminal activity to the police, typically of a sort which is treated in the setting like it is shocking and transgressive but which is rather tame in the grand scheme of things – dealing in stolen antiques, sure, murder and mutilation, nope. Generally, this is the sort of high-concept game which will succeed if you are able to convey the rather specific conceits of the setting and everyone recognises the sort of stuff you’re riffing on, but will fall flat for those without prior exposure to its inspirations – in this case, Enid Blyton and her imitators. It’s a hard genre to take especially seriously these days, but that’s fine – as well as working just fine if you want to implement a sincere spin on the concept, the system should also hold up just fine if you want to go parodic with it. Its not a system with an enormous number of bells and whistles, but to be honest the main value here lies in Washbourne even suggesting that such stories could be used as the basis of an RPG and providing a vague framework for doing so: anyone who buys into the idea at that point will doubtless be able to make it all work without needing the system to corral them all that much. This gives the Bunnies & Burrows treatment to Prairie Dogs on the American Great Plains, whose culture naturally mirrors that of the Native American cultures of those Plains. To be honest, I can’t really get into it – the aesthetic is shallow enough to feel a little too close to lazy cultural appropriation rather than any sort of deep exploration with an eye to developing greater understanding; in general the game follows Washbourne’s usual design approach, but the core concept doesn’t appeal to me enough to inspire me to look much deeper into it.